New York City kicked off voting on Thursday in its third annual BigApps competition, which rewards apps that use some of the city’s open data sets to build apps. But one of the most popular resources appears to be Foursquare, which is in use in more than half of the top apps in early voting. Six of the top 10 apps use the Foursquare API to augment their features, providing a location layer for the services. The winner so far is Scene Near Me, a mobile web app that pushes notifications to users based on their Foursquare check-in about famous movie scenes shot nearby. 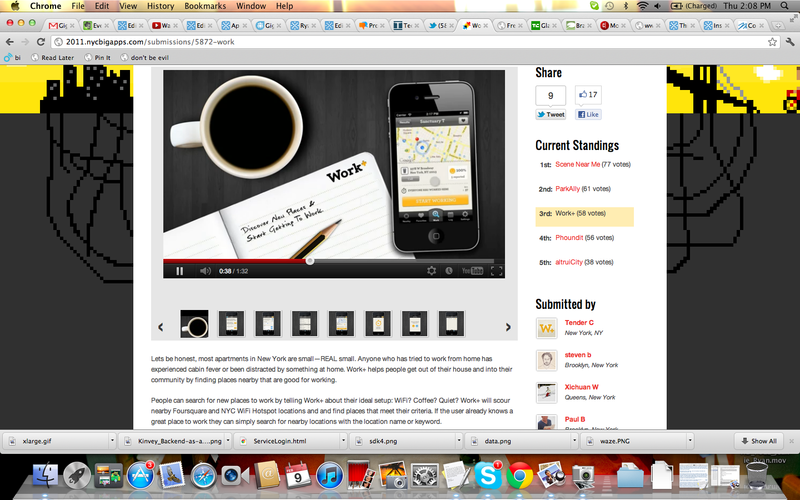 Another top app called Work+ taps Foursquare to help find good working locations for remote employees. Phoundit is an online service for lost-and-found items, providing users who check in to a location with information on items that have been lost or discovered at that location. Foursquare has been used by developers in previous BigApps competitions, and this is the second year it has been featured as an API. But this year, the competition opened up a new category for apps that also utilize an API from a local New York company. That has provided a new boost for Foursquare along with other local companies such as Tumblr, Etsy, bit.ly and others. The BigApps competition is the largest open government initiative of its kind and provides access to more than 700 city data sets. This year’s competition awards $50,000 to winners in 13 categories of apps. The city has 95 submissions in the competition this year, up from 58 last year. Voting and judging continues through March 8, with the winner announced on March 29. In the past the competition has produced some notable startups, including NYC Way, a popular choice award winner in 2010, which I previously profiled. The strong showing of Foursquare highlights some of the work the company has done to raise its profile in the developer community. Last year it announced it had hit 10,000 developers using its API, which now gets thousands of requests per second. The company also hosted two hackathons last year and has worked with the city to promote the local tech community, said Erin Gleason, a spokesperson for the company. “We’re in touch with the NYCEDC [New York City Economic Development Corp.] regularly about how they can continue to support the growing startup community in NYC and bring more engineering talent to the city. And, since a lot of the public data utilized in the competition is tied to physical places, the Foursquare API is a natural fit,” she said. I agree it makes sense for Foursquare to be a popular API in New York, which is a city that is perfect for location-based services. Even without the new category, I think Foursquare would have been a favorite choice of developers, who are realizing how location can be utilized in a lot of creative ways. But more than that, it is cool to see all the different apps inspired by this competition. There are some obvious parking and taxi apps, but there are also some other creative takes that are enabled through the release of so much city data. There are apps that let you know how your local political representative voted and where to find green markets or volunteering opportunities. Hopefully, other cities will take note and see that their municipality can become a platform for developers, who can use open data to do some pretty awesome things that governments can’t do themselves. That ultimately benefits residents, who end up being the real winners in these types of competitions. Dayana- there is a specific education app award, so I would hope there are a few in there. It’s a shame there is no app categorisation in the submission gallery. Are there any good education apps? Voterfriendly is a voter education app and there is one called Sage that is an NYC school app. What kind of ed app are you looking for? Foursquare was definitely the #1 API in the contest, right through from the hackathon to the final submissions. My app uses it to find taxi destinations, and allows you to add your check-in information while you’re on your way- then checks you in when you arrive. It’s called Taxonomy, and I’d appreciate any feedback!